Website and processes: 27 May 16 anon, 5/5 Excellent "Website all worked well and booking confirmation as instant as was promised. Live chat on Christmas Eve - brilliant, thanks! This enabled us to get query answered instantly and therefore buy without delay. Would be useful to see minimum (and maximum?) 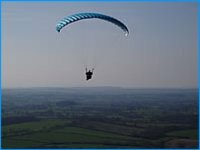 ages added to the flight lessons descriptions..."
Enjoy a day of adrenaline filled yet picturesque paragliding over the jurassic coast. You're in safe hands with experienced and friendly instructors. Paragliding is the purest form of flight available to us. The wing weighs just a few kilos and is easily portable. With a steady breeze blowing up a cliff you can soar all day in perfect relaxation. If adventure is your thing you can climb up thousands of feet in thermals and then glide for many miles. If adrenaline is your thing you can learn to throw your paraglider around to do some of the most dynamic aerobatics imaginable. Dont miss this once in a life time experience! You need to be at least 16 years of age though you can take a Taster Day at 14 or 15 provided your parent or guardian is present. You don't need to be exceptionally fit or strong. You do however need to be able to run fast for short bursts when necessary and most importantly walk back up the slope carrying your equipment many times over. Maximum Weight is 20 stone. Event takes place at Dorchester in Dorset .